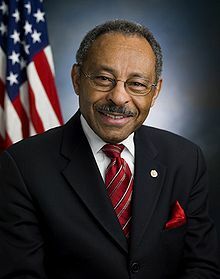 Roland Wallace Burris (born August 3, 1937) is an American politician. He was a United States Senator from the state of Illinois. He is a member of the Democratic Party. In 1978, Burris was the first African-American elected to statewide office in Illinois, when he was elected Illinois Comptroller. He was in that office until his election as Illinois Attorney General in 1990. Since then, he has unsuccessfully run for office four more times. Burris was born on August 3, 1937 in Centralia, Illinois. He studied at Centralia High School, Southern Illinois University Carbondale, at the University of Hamburg in Germany, and at Howard University School of Law. Burris is married to Berlean Miller. They have two children. He has lived in Chatham, Chicago, Illinois since the 1980s. He built his own tomb at the Oak Woods Cemetery in Chicago. ↑ Bell, Debra (January 5, 2009). "10 Things You Didn't Know About Roland Burris". U.S. News & World Report. ↑ Slevin, Peter (February 19, 2009). "Clouds Gather Over Roland Burris". The Washington Post. p. A01. He wanted to end his career with a statewide office", said friend, traveling companion and WVON radio host Cliff Kelley, who recalled Burris becoming upset when others were mentioned as potential Obama successors and he was not. "He really wanted this. He never thought he'd get it, but he was hoping for it. ↑ "You write the caption: Roland Burris' tombstone". Chicago Sun Times. January 8, 2009. Retrieved January 15, 2009. Wikimedia Commons has media related to Roland Burris. Bell, Debra (January 5, 2009). "10 Things You Didn't Know About Roland Burris". U.S. News & World Report. This page was last changed on 6 January 2018, at 21:40.